If you have been blogging for a while, then you probably already have enough blog posts to create over 100 podcast episodes. All you have to do is dictate your blog posts into a microphone. It is one of the easiest ways to repurpose the content you already have. And out of all the ways you can repurpose your content, it has the biggest upside, by far. While the vast majority of podcasts are interview based, there are some, like mine, which are solo shows. Each week I break down a new tactic or growth hack, which comes from a 1200 to 1500-word blog post I created. 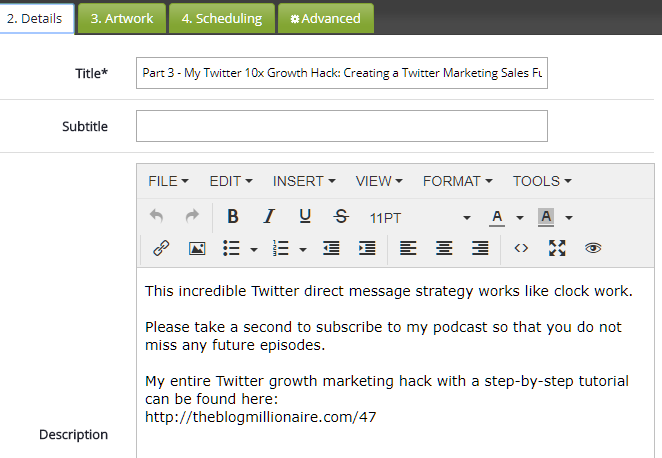 The blog post acts as my transcript, which I use to record each one of my podcast episodes. On top of being real easy to execute, there are a few other good reasons you should turn your posts into a podcast. Reason One: The competition is low. 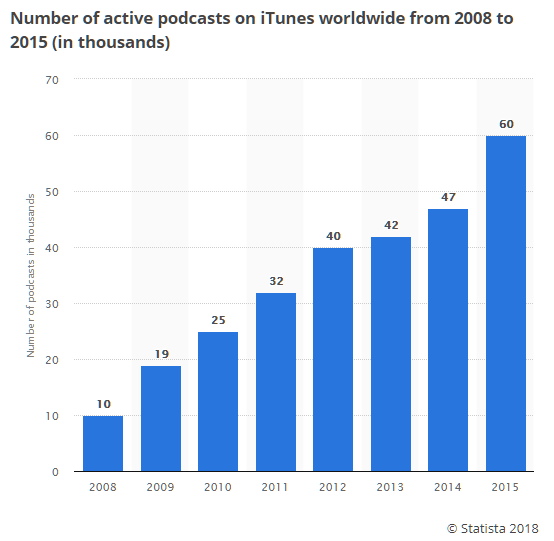 There are less than 500,000 podcasts in existence, and that includes the active and inactive podcasts. As far as active podcasts, there are less than 100,000. 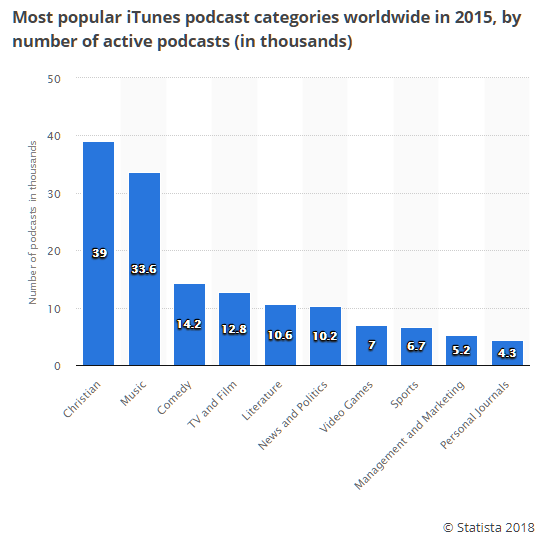 If you look at the iTunes categories with the most active podcasts, then you can see that Christian, music, and comedy podcasts have the most competition. To give you a couple of points of comparison… There are about 1 billion blogs and websites in the world, and there are right around 50 million YouTube channels. If you have been using YouTube, then you know how much easier it is to rank number one on YouTube search as opposed to doing the same for Google search. And that’s going from 1 billion competitors to 50 million. Search and video are both dominated by one big player accounting for over 90% of the market share. The same holds true for the podcast market, with iTunes monopolizing the entire market. Reason Two: Podcasting is the last marketing channel whose subscription guarantees 100% delivery. As a blogger, you know the value of an email subscriber. However, even in the best-case scenario, you are looking at an open rate of 30%. Between spam filters and Gmail’s promotion tab, a big portion of emails never even get seen by our email subscribers. When someone subscribes to a podcast, every single episode is automatically downloaded to their mobile phone. On top of that, 86% of subscribers listen to most of or all of each episode. Could you imagine if 100% of your emails were received and 86% of the subscribers clicked on and read most or all of your blog posts? It sounds unbelievable, but that is the power of podcasting. Reason Three: There is no medium that builds a relationship with your audience like a podcast. A weird thing happens after listening to hours and hours of someone speaking directly in your ear. You build a real emotional bond with them. I get excited each week when one of my favorite podcast hosts releases a new episode. It is the same excitement as meeting up with a friend or mentor in person. Because of the intimate relationship built between the podcaster and their listeners, the engagement with recommendations and ads are off the chart. Almost every online course that I have bought in the last two years came from hearing about it in a podcast episode. The average CPM advertisers pay for an ad on a blog is $2.80. That means for every 1000 page views that your blog gets you will get paid $2.80. The average CPM that advertisers are paying for ads on podcasts is $30. I do not run ads on my podcast, but I do recommend signing up for my one-hour masterclass. The signups to the masterclass from my podcast amount for over 50% of the revenue generated from my online course. Just to be clear, I am not advocating spending more time podcasting than blogging. While blogging has more competition, there is also a bigger chunk of the pie available for everyone to eat. 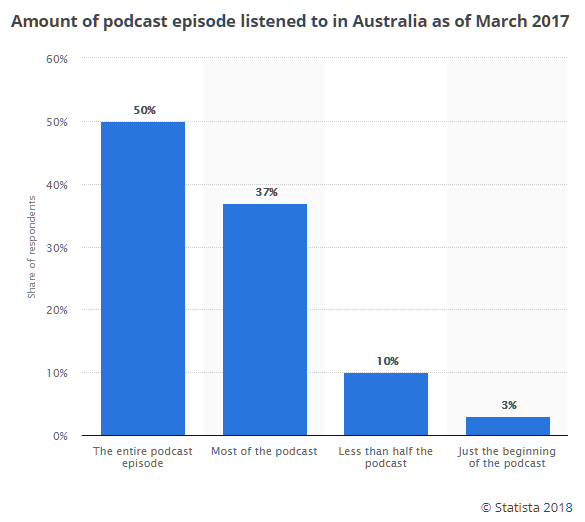 Depending upon the category, the most successful podcasts will have between 5000 and 20000 subscribers. You can be in the bottom ten percent of websites in your niche and still get 10 to 30 thousand visitors a month. 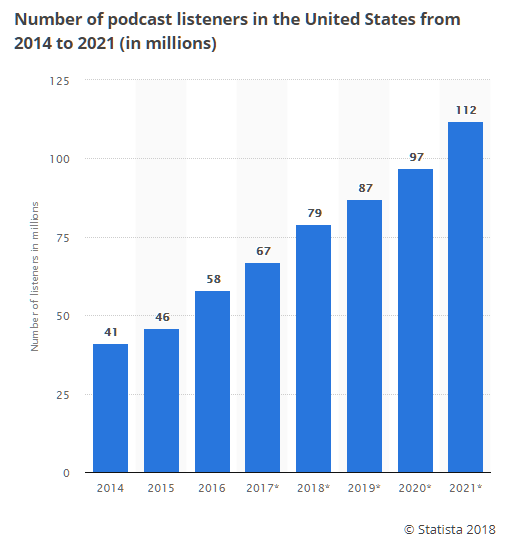 With that being said, the podcast market size is growing at a dramatic pace. The podcast is a way to take your relationship with your blog readers to the next level. There are three stages of a relationship in the ideal blogger engagement strategy. That is when the two of you come together through a Google search. The person visits your website for the first time. After they visit your blog, they either leave or seal the date with a kiss by subscribing to your email list. Once they are on your list, the two of you are officially in a relationship. You see each other 30% of the time, but the commitment is not that strong. The final stage is getting them to subscribe to your podcast. At that point, it is like a marriage, and every podcast episode is downloaded and listened to. They learn intimate details about your life, which include the good and the bad. With each passing episode, a unique trust builds between you and your audience. It is a trust that no other channel can get close to. A podcast by itself is probably not going to create enough income to support your lifestyle. However, when paired with your blog and email list, it can produce amazing results. If you are just getting started, then I recommend getting a microphone, pop filter, and audio editing software. For the microphone, I suggest that you go with the Audio-Technica AT2020USB+ Cardioid Condenser USB Microphone. 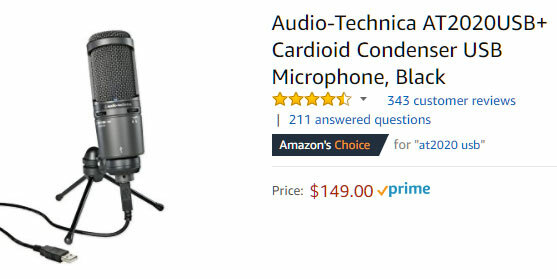 It runs for $149 on Amazon, and it is dollar for dollar the best microphone on the market. It is a plug and play USB, so there is no extra setup required. You do not want to cut corners with your microphone because a podcast with bad audio quality has no chance to succeed. The pop filter is a little round circle that goes between the microphone and your mouth. It smooths out the sound by cutting down the emphasis of Ps and other letters that tend to pop. InnoGear has a nice pop filter on Amazon for $8. For the editing software, Audacity is the best software to use for beginners. It is free and easy to figure out. If you have a Mac, then Garage Band is another great option for editing software. Let’s move on to identifying your first ten episodes of your new podcast. You will launch your podcast with at least five episodes. The reason for this is because you want new listeners to download more than one episode if they like what they hear. I will dive deeper into this strategy later on in this post. The next five episodes of your first ten will give you five episodes in the hole. If you are running a weekly podcast, this gives you five weeks of cushion in case something comes up. Trust me, all kinds of things come up, so always keep a cushion. For these ten episodes and beyond, I recommend using a Google spreadsheet to plan them out. I keep it simple. I have columns for the date to publish, the URL of the blog post for the transcript, the iTunes title, and the iTunes description of the episode. You will start the process by going through all of your past blog posts. As you scan through the posts, look for ones that would be great for a podcast episode. Once you have your list of blog posts, then try to sort them into mini-themes. For example, I might go three episodes in a row on email list building and then four in a row on SEO. This will help immerse your listeners into a group of episodes on a related topic. After you have identified your first ten episodes, then it is time to write titles that are SEO’d for iTunes search. Writing titles for iTunes SEO is a little different than writing titles for Google SEO. The best formula to use is what I call the click bait and SEO hybrid. This is where you will create a very clickable title in the front end, while including your target keyword phrase in the tail end. In iTunes, you have around 108 characters to work with, so there is room for both a click-bait title and an SEO title. The click-bait portion, Your Puppy Needs This to Be Healthy, will always be at the beginning of the episode title. It ropes them in to get them to click play. The second portion will be loaded with the keyword phrase or phrases you are targeting. That title… Your Puppy Needs This to Be Healthy – The Best Dog Food for Puppies clocks in at 67 total characters. There is room to add another related keyword phrase to this title. Since the iTunes ranking algorithm is pretty basic, it makes sense to get as much out of your titles as you can. By using SEMRush to do deeper keyword research, I found a few more phrases to fit into this title. That brings the character count of the title to 87 characters. Whereas with Google SEO, you have to focus on long-tailed phrases with low competition. In iTunes SEO, you will focus your efforts on the phrases with the highest volume of monthly searches, regardless of competition. A common mistake that many podcasters make is leading their episode titles with the episode number. The number is taking up valuable real estate. You want your potential listeners to get right into the click bait portion of the title. This goes for both iTunes search results and your subscribers. The show art will be the first impression you convey to potential new listeners. The keywords used in your title and by line will determine which words your show will come up for in iTunes. When your podcast comes up, the show art is what is going to be seen and read. A mediocre show art image can destroy your click-through rate from iTunes search results. Here are some ways to turn you podcast show art into an extremely clickable image that drives listens and subscribers. #1 Make sure it follows the requirements of iTunes. You can go to Canva to build your show art and use their CD cover templates. 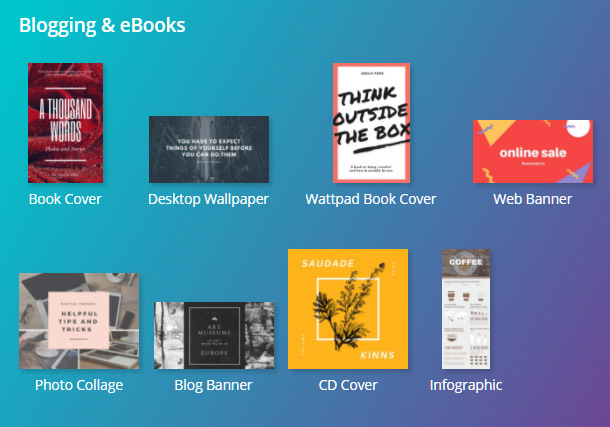 In the templates area of Canva, it is in the Blogging and eBooks section. The CD cover templates are already sized to 1400 x 1400. #2 Design your show art to be scalable. A 1400 x 1400 image at 100% scale will always be legible. The reality is that the image is going to be scaled down for smartphones, which is where 98% of podcasts are listened to. Your show art should pass the sugar cube test. That means you should be able to read your cover art when it is the size of a sugar cube. #3 Make the title of your show art short and memorable. The show art of the most successful podcasts have two to four words within the image. Those two to four words will cover between 60 to 80 percent of the show art. This will make your title legible when scaled down to the smallest of image sizes. You want your show title to state the topic of the show, so the searchers can quickly identify what your show is about. In addition, you want to include one high volume keyword in the title. For example, the title of my show is The Blog Millionaire. That title takes up close to 80% of the show art. Here are a few other examples of great show titles. From the kids and family category. #4 Your cover art should not have your picture on it unless you are a widely recognized personal brand. This is a common mistake that most podcasters make. Your cover art is precious real estate that will play a huge role in how successful your podcast will be. Over 1 million people read my blog every month. I am guessing that only 20 of those 1 million would recognize my face out of a row of ten other faces. Unless you are the pastor of your church or have a television show, then you should not include your face in your show art. #5 Make the colors of your cover art pop. A solid color background jumps off the page in iTunes search and category ranking pages. Black, red, and blue are the big colors that stand out the most. Stay away from white because it blends into the white background in the search results. I used a black background with a primary text color of orange-yellow and a secondary text color of white. If you incorporate these five tactics, then you will have a top-notch piece of cover art for your podcast. Equally important as the show art are the show title and by line (which is also called “provider”). If you optimize these two lines the right way for iTunes SEO, then you can have a consistent flow of new subscribers to your podcast. Before I get into the how, let me explain real quickly how iTunes search results work. Regarding podcasts, two types of search results will come up when someone searches for a particular phrase. The first type is episode first results. This search result shows ten podcast episodes at the top of the search results, and it is followed by a row of podcast shows. The episode first results are the type of search results that you will target with your episode titles. You will do this with strategicially placed keyword phrases at the tail end of your episode titles. The second type of search result is the show first results. This is essentially the reverse of the episode first results. The row of podcast shows are listed first, and they are followed by the ten podcast episodes. 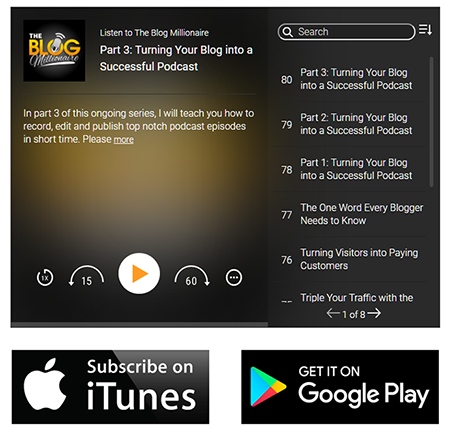 The keyword phrases with podcast show results are the ones you will target in your title and by line. The words in your show title and by line are going to determine where you will come up in search results. The show title is weighted approximately 50% more than the by line in the iTunes search algorithm. Another component of the ranking algorithm for search results is the number of total subscribers for a show. So, if two shows are equally optimized for the same keyword, then the one with more subscribers will be ranked higher. The good news is that the vast majority of podcast shows are not optimizing their shows for iTunes SEO. The first week after my podcast went live, I was already ranking in the top 5 podcast shows for most of the phrases I targeted. Let’s start with the show title. The show title has the greatest impact on your search ranking. It is also more visible than the by line. Under your show art, the first 50 characters of the title can be seen. The by line shows up underneath the title, and only 17 characters of the by line are visible. Your show title should be between 80 and 88 characters long. Since the first 50 characters of your title are visible to all, you will lead with the actual title of your show. After the actual title, you will include a list of super high traffic terms that your podcast covers. This title allows their show to come in iTunes search for couples, relationship, marriage, couples advice, relationship advice, marriage advice, relationship advice for men, and relationship advice for women. When people are searching for shows they are typing in high volume broad words. That is why you target only high-volume broad phrases in your show title. 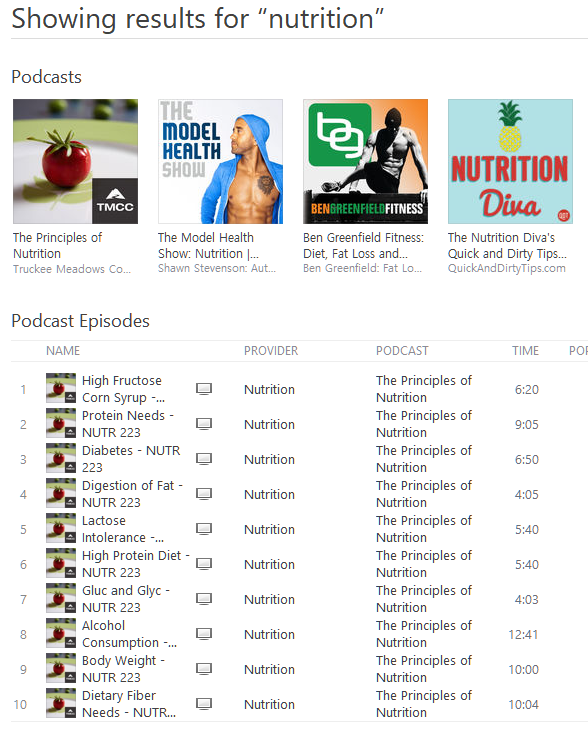 Here is another example title for The Health Food Nut podcast. It leads with the actual title of the show, The Health Food Nut. It is four words long and easy to remember. It also incorporates a high-volume phrase in the title, Health Food. Then it includes three additional high-volume words in the deeper topical description, which are how to lose weight, weight train, and nutrition. The takeaway here is you want your title to make sense and explain what your show covers with high-volume keyword phrases. The line that comes up right beneath your title in iTunes is called the by line. This is essentially used to state who the host is or the company that runs the podcast. Although this is weighted less than the title in the iTunes search algorithm, you can still easily rank for high-volume terms by mentioning them in your by line. You have a maximum of 168 characters to work with in the by line. It should always start with your full name. After that, you can mention additional topics you cover in your show. Let’s stay with The Health Food Nut example. Once again, the title for that show was The Health Food Nut: How to Lose Weight, Weight Train, and Advice on Nutrition. Stacey Johnson talks about ways to improve your health through meditation, pilates, yoga, keto, mindfulness, sleep, and low carb diets. Once again, your by line needs to make sense, and it should only include topics that your podcast covers. There is one other note that I want to make about your title and by line. Never include names of other people or shows. This is an iTunes violation. For example, do not include Tim Ferris or NPR in your title or by line. ITunes still has a basic search algorithm. Because of this, you can change your title and by line to test new keywords every day. If you are only ranking for 4 out of 13 of the words in your title and by line, then you can swap out the 9 you are not ranking for with new ones. It takes about four to twelve hours for your new words to be active in the iTunes index. You can repeat the process every day until you rank for every keyword in your title and by line. After your podcast has grown in total subscribers, then you can come back and try to rank for some of the original terms you could not rank for. 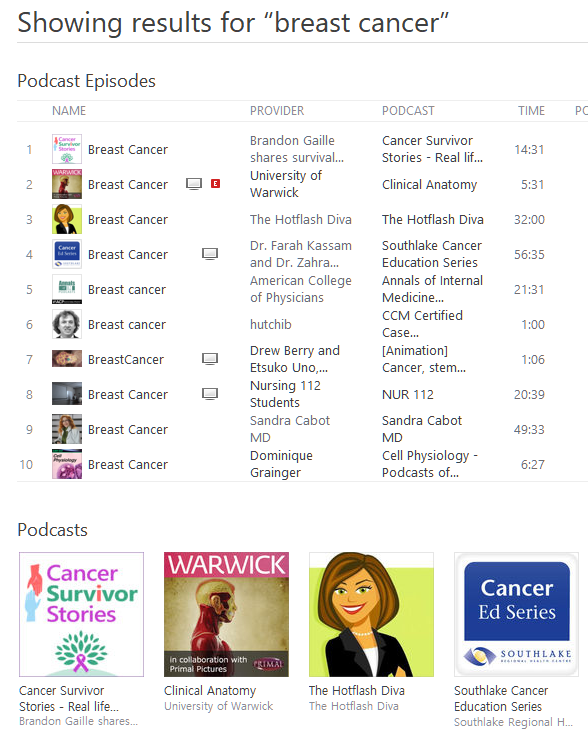 The iTunes search algorithm combines the frequency of the keyword in the title and by line along with the total number of subscribers a show has. As your subscribers go up, you can rank for more competitive phrases. Your show description should convince browsers to listen to your podcast. Focus on how your podcast will help them in 500 words or less. I use the first two sentences as the hook, and the last sentence is used to list out the topics I cover. 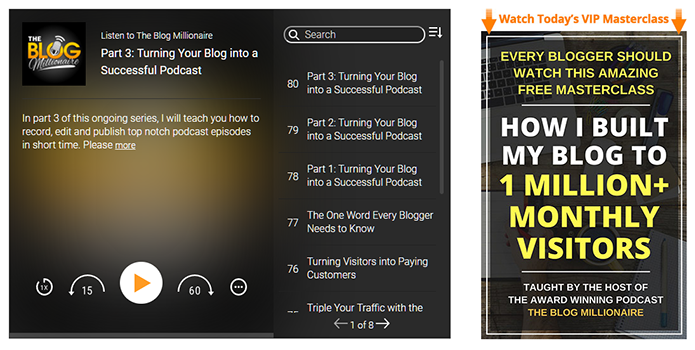 The Blog Millionaire podcast teaches you the secret blogging strategies that pro bloggers use to grow their traffic and monetize their blogs. Our host, Brandon Gaille, built his blog to over 1 million monthly visitors in less than two years after his first blog post. He will guide you down the path to becoming a master of blogging, WordPress, SEO, search engine marketing, internet marketing, social media marketing, email marketing, email list building, content marketing, website engagement, conversion optimization and many many more to help you build your very own blogging empire. The description has a weight of about 5% in the iTunes search algorithm. It is not going to impact your rankings too much, but it is still worth listing out your topics in the last sentence. Here are the nine best practices for recording new episodes, that podcasters live by. #1 Find a quiet room to record in. Bedrooms are usually the first place to start. All bedrooms have a bed with a comforter. Many bedrooms will also have drapes. Both the bed and the sheets will absorb sound. This will contribute to a higher level of audio quality. It is also easy to close the door and allow other family members to carry on with their normal activities. 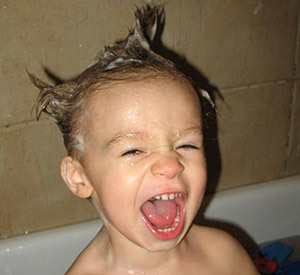 Whether you have a baby, a child, or a dog, all three of these tend to occasionally scream out. If you do not have drapes in your bedroom, then you can use your closet as your recording studio. A walk-in closet, with hanging clothes to absorb sound, will rival the audio quality of a professional study. #2 Wear headphones when recording and turn up the sound. The reason for wearing headphones is so you can hear what your microphone is picking up. By turning up the sound, it will all you to hear anything that gets through that you do not want showing up in your episode. 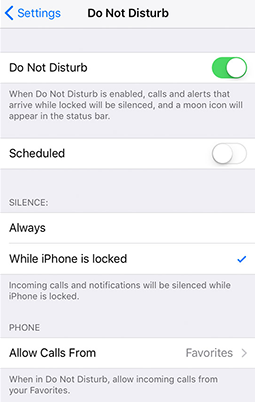 #3 Turn off your cell phone or use the do not disturb setting. I have a special setting on my cell phone called “do not disturb.” This setting is on iPhones and most Android devices. It allows you to only receive calls from the numbers you have marked as a favorite with a star. My starred numbers include my wife, the school my boys attend, and my highest paying clients. By using this feature, my phone rarely rings when I am recording. #4 The only thing that should be running on your computer is your editing software. Each additional open program pulls resources from your computer’s RAM and CPU. The more windows and programs you have open, the greater the chance that your audio editing software will crash. Nothing is more frustrating than losing 20 minutes of your best stuff from a software crash. I learned this the hard way. #5 Print out your blog post that will be your transcript to read from. When you print it out, choose the option to take out all pictures and ads. Another alternative is to copy and paste into a word doc, which will give you a text-only script tailored to the font size you need. After you print it out read through your post silently once or twice. If you record the first time you read it, then it will sound like you are reading it off of a script for the first time. This always sounds awful. Another alternative to script prep is to read two paragraphs, then record, then pause, and repeat the process over and over again until finished. On days when I am a little sluggish, I use this technique. #6 Print out a simple phrase to start off your episode to transition into your blog post transcript. Most of your blog posts will need an extra intro to transition into the content of the post. It is best just to type this down and print it out also. #7 Start by doing a test recording of ten seconds to make sure everything is working right. About once every ten episodes, my test audio is all messed up. Usually, it is because a connection is loose. Other times it is because my computer chooses the wrong microphone. This ten-second test is a must for every episode. #8 Channel your inner Tony Robbins to come across with energy. The most successful podcast hosts have lots of energy. 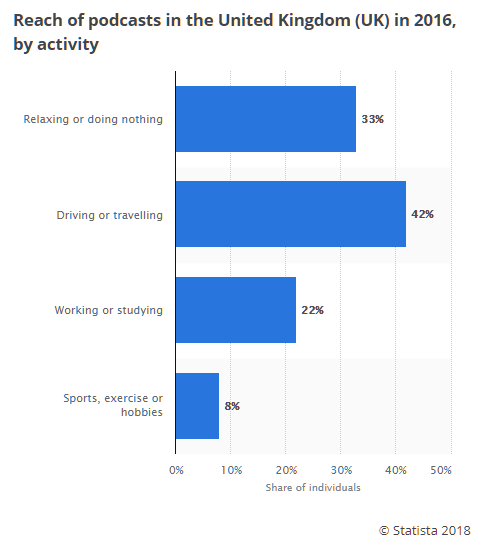 Most people consume podcasts while driving in their cars, walking, running, or at the gym. No one doing these activities wants to listen to a monotone voice read words to them. If you record your first episode and it still sounds dull, then consider standing up when you record. My best energy comes after a workout or a brisk walk. You can also do some push-ups or jumping jacks to get your energy flowing. #9 If you mess up, then do not worry. Each time I stumble on a word I stop and delete the stumble. After that I read the paragraph one more time before hitting record again. By deleting your stumbles right away, it will cut down your editing time. The last thing you want to do is to start completely over every time you make a mistake. These nine tips will allow you to record great episodes with minimal editing. Regarding editing episodes, I will not spend too much time covering the ins and outs. I will start by saying it again, you must read your transcript once or twice before you record. This will cut down your editing time in half. If you buy a quality microphone, then there will not be a whole lot of editing you need to do. After I record my episode, I listen to it from beginning to end to make sure I did not accidentally let something get recorded that I shouldn’t have. All of my edits are essentially deleting pauses between starts and stops of my raw recording. Your intro will be a 30 second bumper at the beginning of each of your episodes. This only has to be done once, and you can use the same intro for every single episode. Before you hire voice talent to record your intro, you must create a script that accomplishes four things. Let’s look at my intro. Welcome to The Blog Millionaire, where we break down the essential strategies of today’s most successful bloggers to take your blog to the next level with top-notch content, monumental traffic growth, and multiple revenue streams to go beyond your wildest goals. 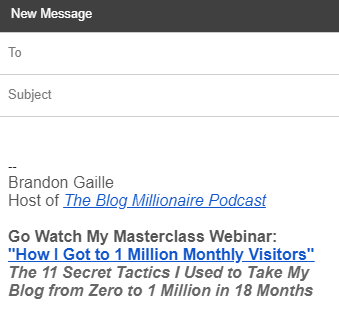 So, get ready to blog like a pro and make your traffic explode with your host, whose blog gets over 1 million visitors every single month, Brandon Gaille. Now, I will break down the parts of my intro to show you what every good intro should accomplish. #1 It welcomes them and states the name of the show. #2 It tells them what they will learn by listening. #3 It lets them know how they will benefit. #4 It introduces the host and tells them why they are qualified to be the host. With your host, whose blog gets over 1 million visitors every single month, Brandon Gaille. I recommend against trying to do your intro yourself. Podcast listeners have been conditioned to associate professional intros with a top-notch podcast. Every time they hear a podcast without one, they tend to back out and not even given the podcast a chance. As for publishing your episodes to a host, I recommend using Libsyn. I use the $20/month plan. They are the market leader in podcast hosting. Once my episode has been editing, I upload it to Libsyn. After the upload, Libsyn prompts me to add my title and description for the episode. I grab my optimized title from the Google spreadsheet and drop it in. Then I write a short description. Your description should be one to two sentences long, which teases what is in the episode. Besides the tease, you will want to include a link to the blog post you used as the transcript, which will serve as your show notes. When I look at my podcast stats, Apple makes up 70% of my downloads. The rest are scattered across 60 other insignificant podcast apps. 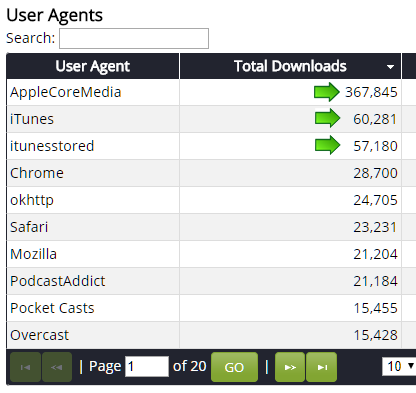 Apple shows up in your download stats as AppleCoreMedia, iTunes, and tunesstored. I say this because you want to focus all of your efforts on getting people to subscribe to your podcast through iTunes. In my perfect podcast landing page, I also have a link to Google play, but that is it. The total number of subscribers your show has also plays a large role in where your podcast ranks in iTunes. This is why the Apple podcast app should be the primary focus of promoting your show to your audience. Now that you know a little bit more about podcast subscribers, let me break down my perfect podcast page for you. There is a simple way I have been converting my website traffic to podcast subscribers, which anyone can duplicate. It is a result of many months of A/B testing. The big turning point, which 10x’ed my results, was being able to automatically tailor two different experiences for mobile and desktop traffic. Here are the five components of my perfect podcast landing page. #1 The first part of your page should lead with four sentences. Sentence 1 = Why they should listen to your podcast. Sentence 2 = Where to listen if they have an iPhone or iPad, with an iTunes link to your podcast. Sentence 3 = Where to listen if they have another device with a link to Google Play. Sentence 4 = How to find the podcast on their smartphone if they are currently looking at the page on a computer desktop or laptop. 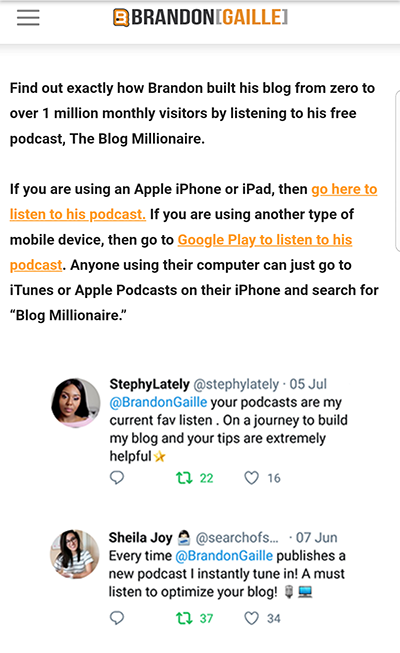 Here are my first four sentences of my podcast landing page..
Find out exactly how Brandon built his blog from zero to over 1 million monthly visitors by listening to his free podcast, The Blog Millionaire. Sentence 2 = Where to listen if they have an iPhone or iPad with a link to iTunes. If you are using an Apple iPhone or iPad, then go here to listen to his podcast. If you are using another type of mobile device, then go to Google Play to listen to his podcast. These four sentences show up above the fold on a mobile device. Sentence two and three, about iTunes and Google Play, have links going to my podcast show on iTunes and Google Play. So when someone clicks on the call-to-action for iTunes on a mobile device, it opens up my show perfectly via the podcast app in an iPhone or an iPad. I use three screenshots of Twitter tweets that say nice things about my podcast, but you can also use iTunes reviews or testimonials. This section will help sway people on the fence to click the link and listen to the podcast. It also strategically pushes my podcast player down the page on mobile. Here is how it looks on a mobile phone above the fold. I want to funnel my mobile traffic to iTunes or Google Play. If the podcast player shows up too soon, then they will end up listening to my podcast through the podcast player on my blog. This would essentially kill any chance I had of converting that traffic to an iTunes subscriber. The podcast player is there for people that are viewing the page with a computer. It sets below the trust signals, and it is only instantly visible to people using a computer. This gives them the ability to click play and listen directly from their laptop or desktop. If they like it, then the call-to-actions to iTunes and Google Play below the player will remind them to get out their phone to subscribe. As you are aware, my outro asks my listeners to watch my free masterclass webinar, “How I Built My Blog to 1 Million Monthly Visitors.” By placing a call-to-action for my webinar to the right of the podcast player, it makes it real easy for visitors listening through my podcast player to click and signup to the webinar. And, here is what it looks like with the call-to-action. If you want to take a look at my actual podcast landing page, then go here to see it in action. I recommend you visit my podcast page and just copy the same template for yourself. All you will need to do is swap out your four sentences, testimonials, and podcast player. When you look at my podcast page on both a smart phone and computer, then you will see how it automatically tailors a different experience for each one. For smart phone users, the page pushes them to listen to the podcast on iTunes or Google Play. For desktop users, the page draws them into the podcast player and positions them to be converted into an email subscriber. Once you have your landing page set up, then you can start strategically directing traffic to it. Here are six tactics I use to drive traffic to my show’s landing page. #1 The top spot in my sidebar. 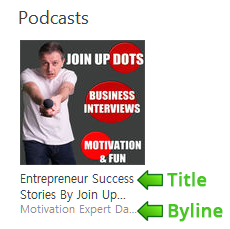 I have square image that is 320 x 320 pixels in my sidebar, which has a strong call-to-action for listening to my podcast. #2 A call-to-action sentence at the end of each of my posts, which only shows up in mobile. Since mobile traffic obviously has the highest conversion rate for podcast subscribers, I use Ad Inserter to program my blog to show my mobile call-to-action. This sentence is shown to anyone reading my blog with a mobile phone. Find out how I built my little blog from zero to over 1 million monthly visitors in less than 18 months. I reveal all my secrets for free right here. #3 In the signature of my email. 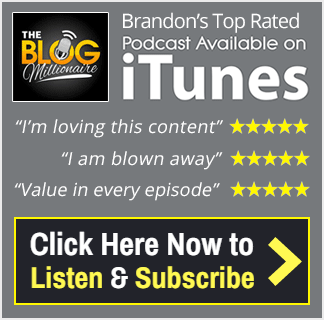 “The Blog Millionaire Podcast” is linked to my show’s landing page. #4 In my Twitter header and pinned tweet. I also will do themed pinned tweets that promote my podcast at different times during the year. For example, from November 1st through December 25th, I had a Christmas themed pinned tweet. My YouTube channel page has a call-to-action link to subscribe to the podcast. I also repurpose my podcast episodes into YouTube videos. My Pinterest pins get viewed over 12 million times a month and generate over 200,000 monthly visitors to my blog. It is by far my most successful social media channel. Pinterest functions more like a search engine than a social media channel. That is why I love it so much. If you have been on the fence about signing up to my course, then the video module showing you my exact formula for getting all this Pinterest traffic is easily worth ten times the cost of the course. 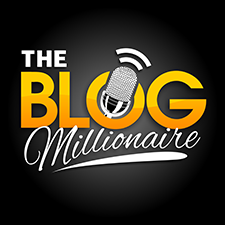 Since I generate a whole bunch of Pinterest engagement, my name of my Pinterest profile is actually, The Blog Millionaire Podcast. Every time a pin is viewed, The Blog Millionaire Podcast is being seen. My Pinterest profile page and bio promotes my podcast with a link to my show’s landing page. Social media is great for promoting your podcast because 90% of social media users are logged in with their smart phone. There are plenty of other ways to promote your podcast, but these are the six that give me the best results. While it is not always that easy to break into the top 150 in the big categories like business and health, there is a clear strategy that will boost your show towards the top of the charts. Each major category in iTunes has a top chart, which lists out the top 200 podcasts. On mobile phones, which is where 99% of podcast listeners listen to podcasts, the top charts show only the top 150 shows per category. If you rank #151, then you are not going to get any extra subscribers from the chart listing. Most power podcast listeners are browsing the top charts looking for new podcasts to listen to. So, getting your podcast to rank in the top 150 can lead to a big boost in new subscribers. The algorithm for determining where your show will rank on the charts only focuses on the number of people that have subscribed to your show within the last seven days. This means every show, no matter how big they are, starts from zero as far as the iTunes charts algorithm is concerned. If you just got completely lost, then do not feel bad. The big takeaway here is that the ranking algorithm is a moving 7 day window, where day 1 subscribers have the biggest impact. 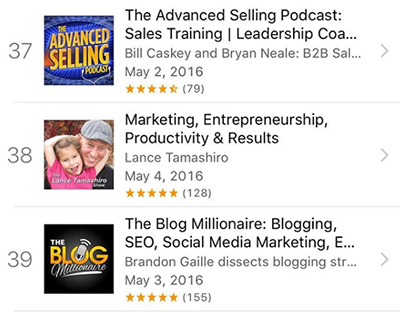 If you have a nice email list and social media following, then you will want to promote your podcast to them at the same exact time. This is because the algorithm multiplies day 1 subscribers by four. Here is an example of how to strategically rank high in the iTunes charts. A church decides that they are going to launch a new podcast to their audience. The church has the following ways to strongly promote their new podcast. They have two Sunday morning services, where they will ask everyone in attendance to subscribe. They will do this by showing a simple visual walk through on their big screens, so they get people to pull out their phones at that moment. They also ask their 100+ staff members to subscribe to the podcast. Many businesses forget about including their employees in their marketing mix. With podcast launches, this can make a huge difference. They send an email out to the 25,000 people on their list. The email asks for them to subscribe to the podcast, and it has a link to iTunes and Google Play. If they did the service on Sunday, asked the staff on Tuesday, and sent the email on Friday, then they might rank #56 in the Religion category. However, if they did it all on Sunday, then they might crack the top 10. Being number #56 might add another 1000 daily subscribers, but a number #9 ranking would add close to 10,000 new daily subscribers. Whenever you promote your podcast, do you your best to push it all out in the same four to eight-hour window. Here are four groups of people, which will say yes to subscribing to your show. Your family, which includes uncles, aunts, and cousins. 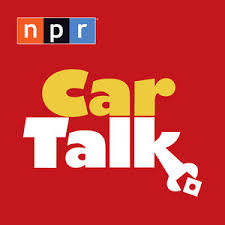 Employees, customers, family and friends can all be sent a text message with a link to your show on iTunes and Google Play. Ask them to click the iTunes link if they have an iPhone and the Google Play link if they have an Android phone. If you really want to get great engagement, then send them an initial text messaging asking them what kind of phone they have. That will start a conversation and allow you to give them just one link. You can also ask your Facebook friends to subscribe. However, do not take the easy route of posting an update because no one will subscribe. Send each friend a private message via Facebook messenger, and begin the message with their first name. Then ask them if they could help you out by taking a few seconds to click the subscribe button on your podcast page. Do not send more than 100 messages per day or Facebook will throttle your account. And that will do it. You officially know everything that I know about podcasting.